What’s the first thing that pops into your head when you hear someone say ‘mohawk’? Punk rockers? Rebellion? Offensively cool – and a tad threatening? Well, whatever your perception of the mohawk is – it’s a head-turner that may not be for everyone. Involving a shaved head with a strip of hair left dramatically in the middle (often dyed green or some other eye-catching colour), it still gets a bad rep sometimes and could mean people will do some fearful staring before you earn their trust. Why are we chatting about the mohawk, anyway? Well, because it is the ‘ancestor’ of the hairstyle for men we’re going to introduce you to today. Meet the faux hawk, everyone, mohawk’s distant relative – and it’s here to tell an entirely different story! 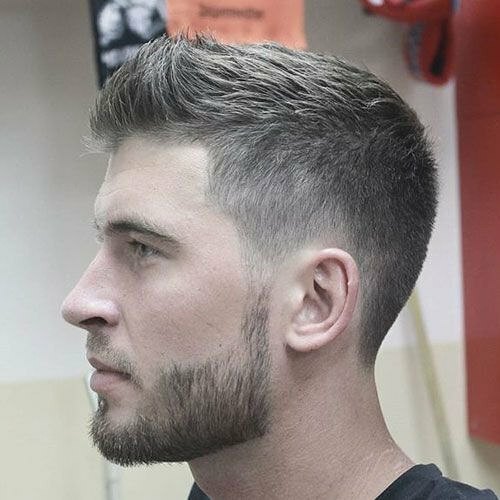 A faux hawk (also known as ‘the fohawk’) is defined by shorter back and sides and longer hair on top. Not too long, but long enough to be spiked up! 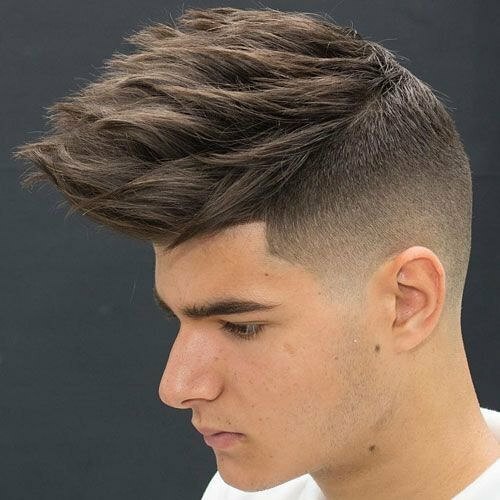 This spiky hair is key to the faux hawk hairstyle and is the element that shows the hairstyle’s connection to the mohawk. The faux hawk is a lot less dramatic than the mohawk – and a lot more urban. 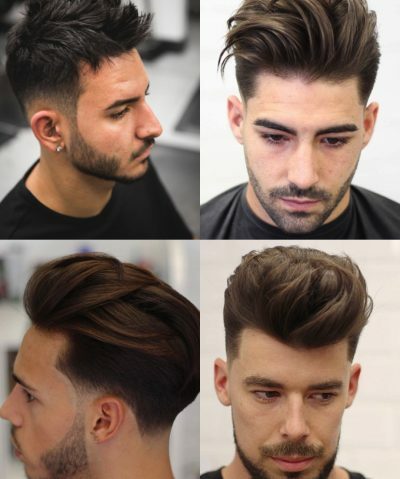 That said – it’s still a statement hairstyle and it will require more guts than many other simpler hairdos for men out there. 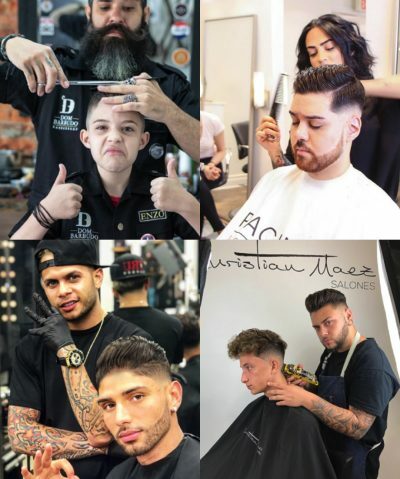 With more people favouring messy hairstyles for men, the faux hawk continues to rise in popularity – and has even has been spotted on the heads of countless men of fame (Zayn Malik, Cristiano Ronaldo and Brad Pitt – to name a few). So, without further ado, let’s take a look at 15 awesome faux hawk styles you’re bound to dig. Who knows – maybe you’ll even consider faux hawk as your next look? You know we’d totally approve. Check out this classy, yet urban faux hawk hairstyle for medium length hair . The texture, the highlights and the fade are all things we’re really into here. 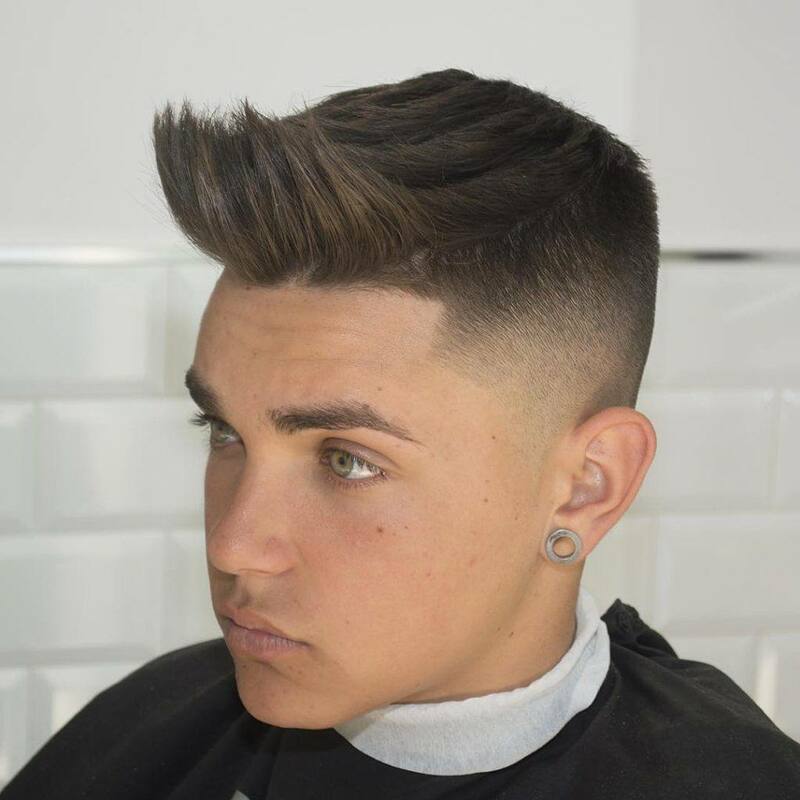 For this particular faux hawk, the clipper size should be set to 0 for the sides – fading into size 2 closer to the top. 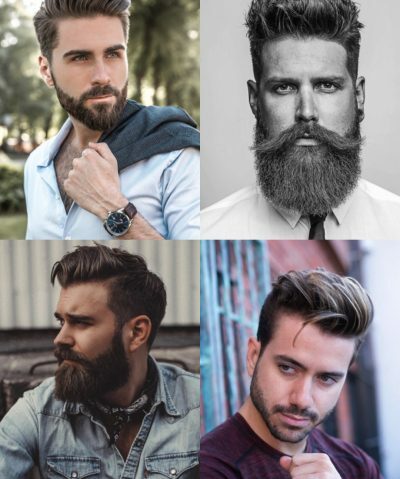 If you’re a man who likes to impress, choose this heavy-on-the-forehead style that’s guaranteed to make people notice. You’ll need to use quite a bit of strong-hold pomade to introduce this look to your hair – but it’ll be worth the effort! Short hair can look just as good in a faux hawk hairstyle – and it’s less demanding than long locks. 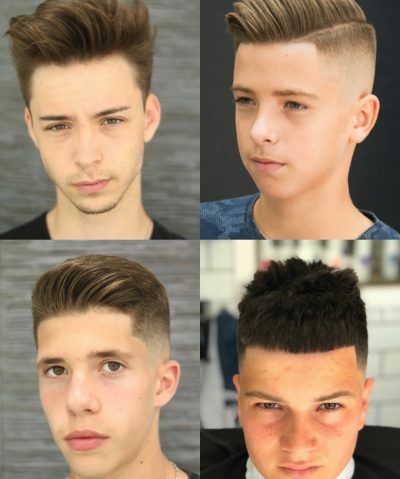 You can either go for a gelled look as in the picture – or choose a matte pomade for a less shiny look. Either way, it’s hot. Now this is where you can really see the link between a faux hawk and a mohawk. 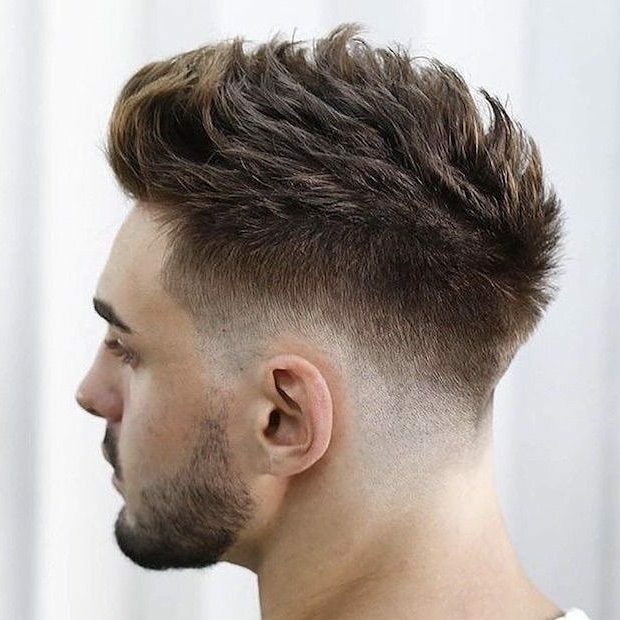 What gives it this effect is the shaved sides that take up a larger proportion of the head, leaving a thinner strip of hair on the top. It may not be for everyone, but we dig! Here’s an example of a cool faux hawk that’s ideal for medium hair. We especially like how the hair’s been brushed up at the front, leaving a large chunk of it to sit neatly on the top of your head. This gradual spike creates an even more impactful look. This hair will perfectly go with a t-shirt that says, ‘I woke up like this’ – if you have one lying around. Cool as hell, this hairdo is the epitome of chaos – so the messier the better! Don’t be afraid to go big on texture with the shaggy faux hawk – sea salt spray on damp hair will do the trick. 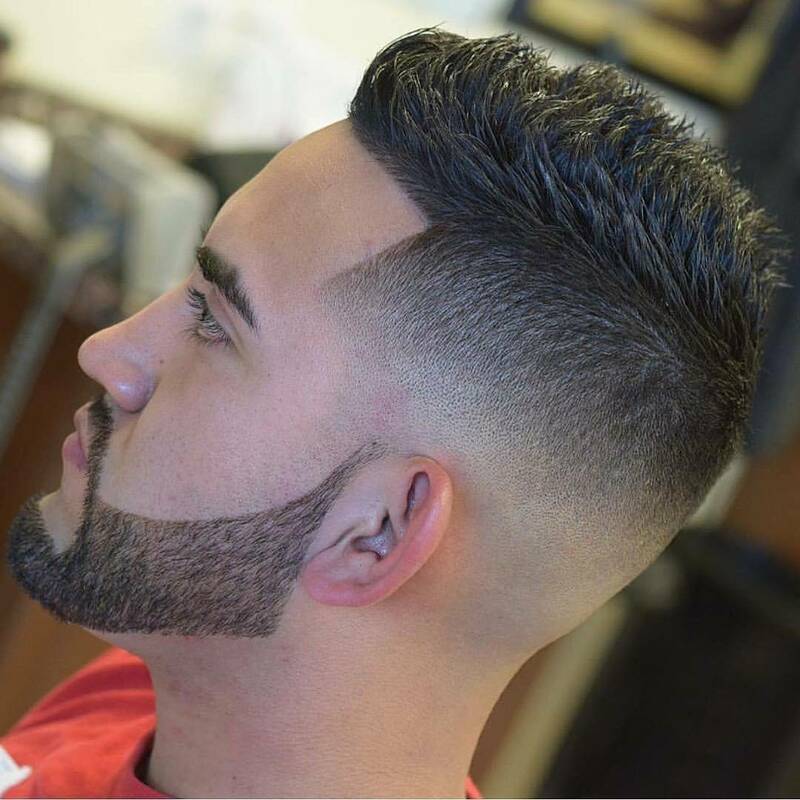 Going for a mid-fade achieves the perfect balance between a high fade and a low fade. 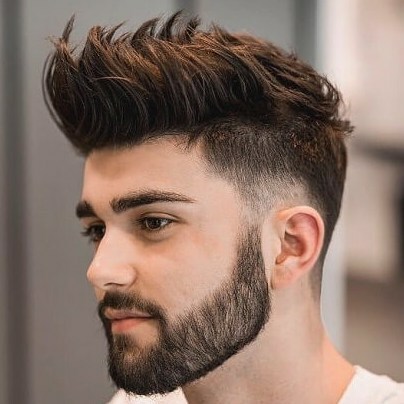 The beauty of this taper cut for men is that it can be combined with pretty much any hair on top – for example, this awesome faux hawk. 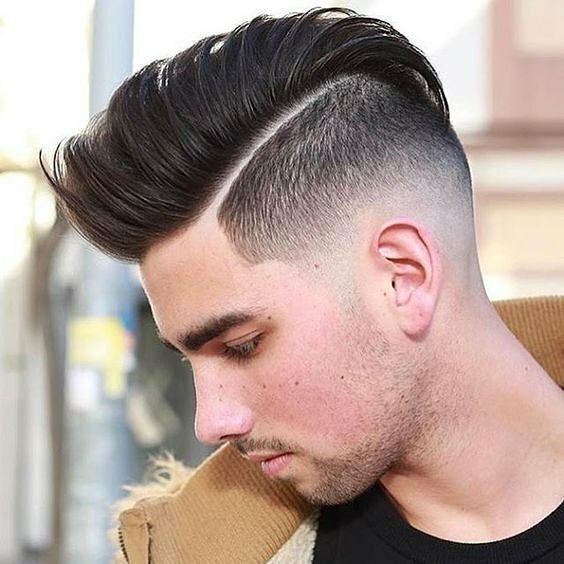 Now if you think just getting a fohawk won’t stand out enough for you – then try adding an accent detail, such as this cool shaved line that runs through the side. 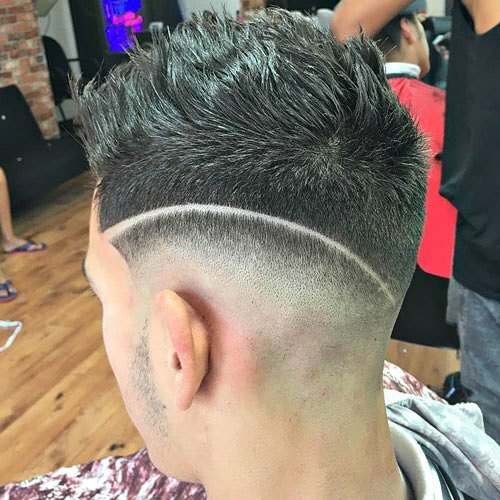 You can get as creative as you like with an undercut and fade – add lines, zigzags – even circles if that floats your boat! We won’t judge. 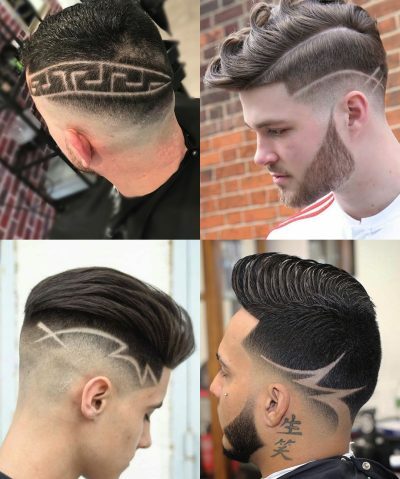 If you have lots of hair, then you’re looking at a hairstyle that’s for you. 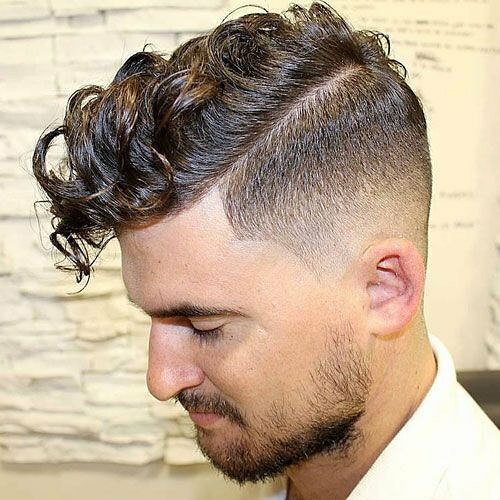 This supersize fohawk is an embodiment of volume and texture – and it’ll work perfectly if you’ve got medium to long hair. 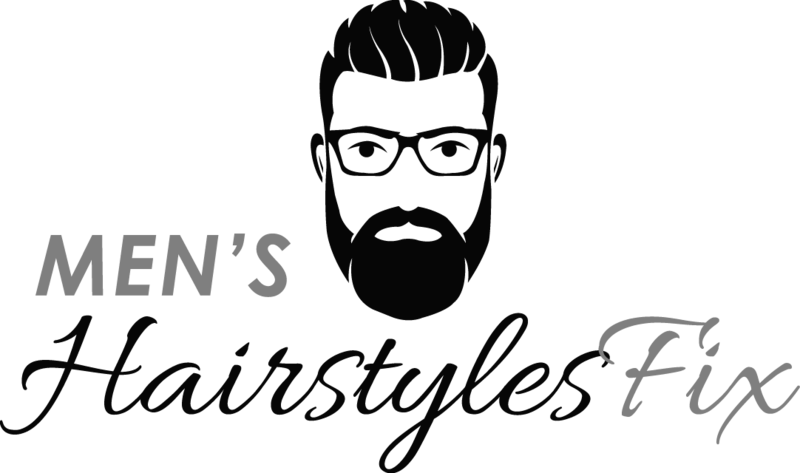 Now, you may be thinking – aren’t ‘neat and smooth’ the direct opposites of a what a fohawk is all about? 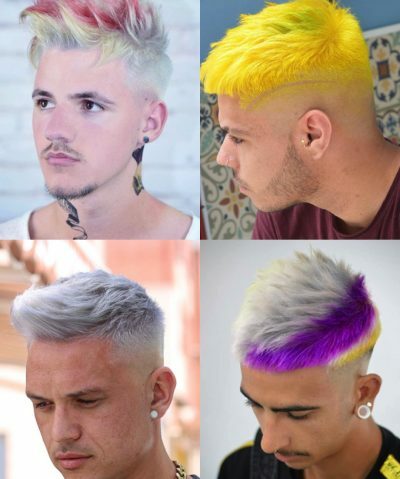 Well, they don’t have to be – today’s hairstyles are all about individuality and you can customise a faux hawk however you like. And if smooth hair is your preference – it’ll work perfectly in a faux hawk form, too. 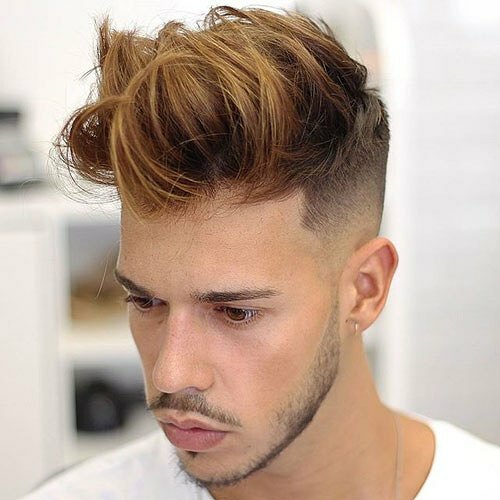 If you’re someone who admires the faux hawk yet isn’t ready to dive head first into the look – then this refined faux hawk for short hair will be the right hairstyle to start with. 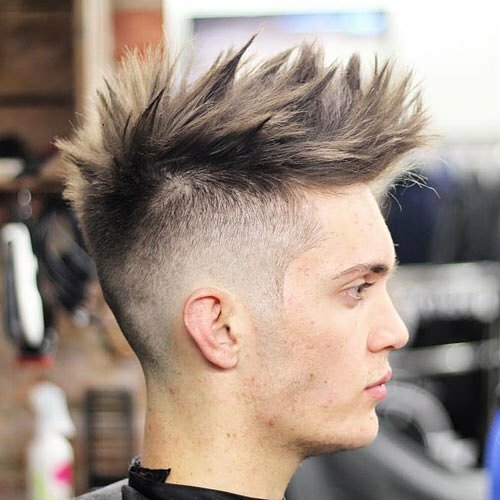 Tapered sides and longer hair on top, with a spiky front – it’s subtle, yet cool. Don’t worry – the faux hawk won’t leave out those with curly hair! If you’re someone who has curls and wants to try out the faux hawk – your look is bound to be even more intriguing. Get ready to meet the perfect combo of smooth and spiky – all in just one hairstyle. 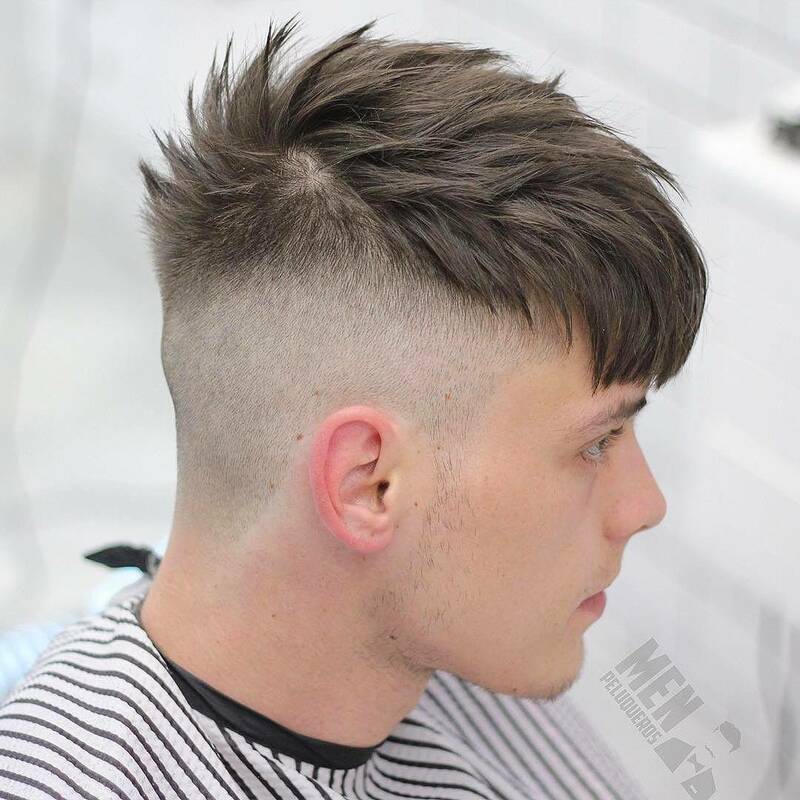 This fohawk with a smooth fringe is a unique look defined by hair that’s chaotically messy on top – and smooth on your forehead. 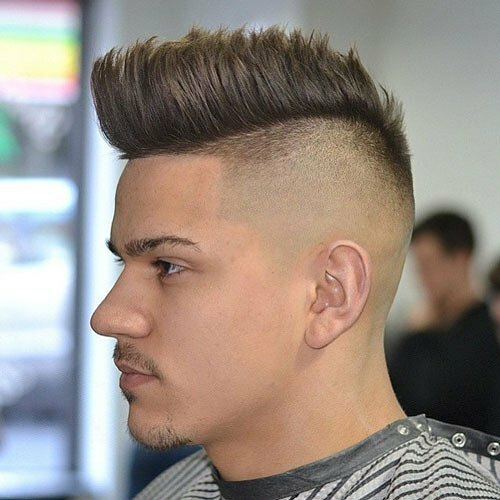 There’s no denying that the high fade faux hawk more closely resembles its distant relative mohawk than other types of fohawks out there. Yep, it may be a statement look and it may trigger some flashbacks for people who are intimidated by mohawks…but it’s trendy as hell! 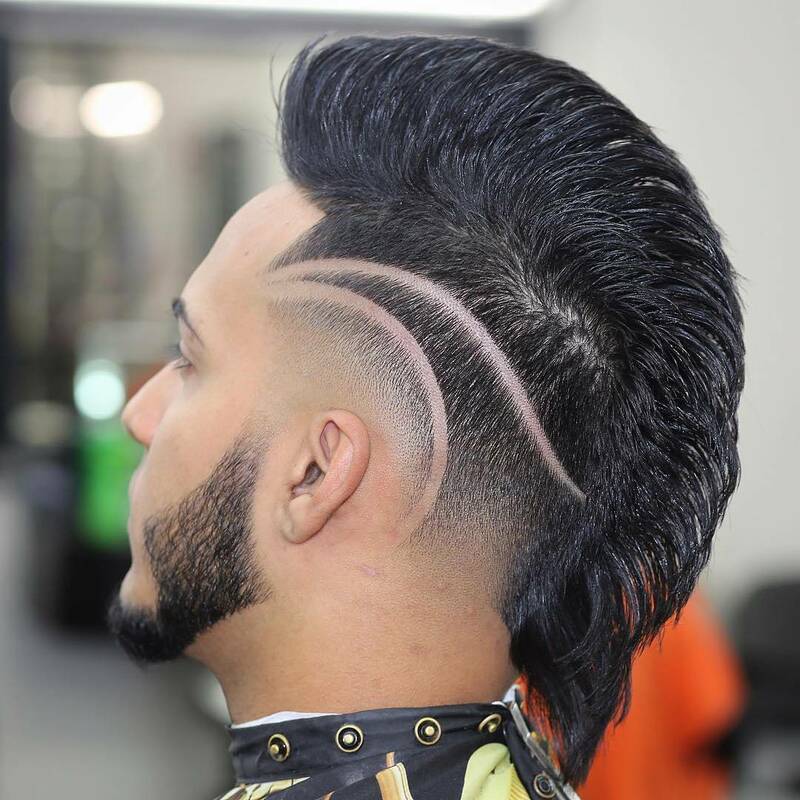 Last but not least – meet this long faux hawk with an awesome shaved design, guaranteed to win points for creativity. 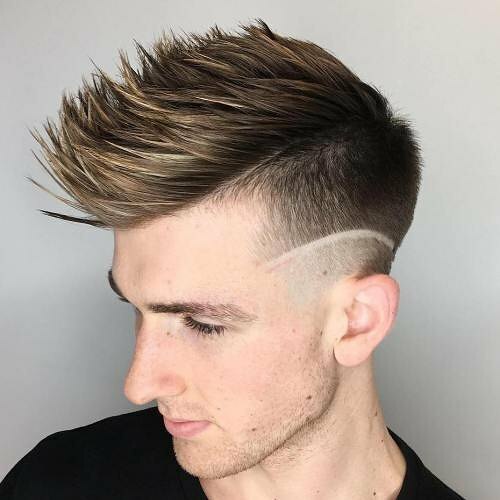 A faux hawk doesn’t have to end at the top of your head – it can carry on until the nape of your neck to create a more eye-catching look. Add a couple of shaved details – and you’re in for the applause.